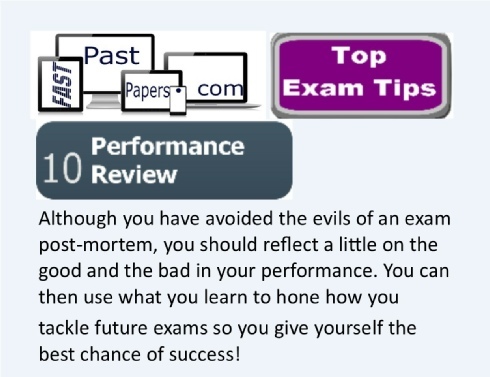 Although you have avoided the evils of an exam post-mortem, you should reflect a little on the good and the bad in your performance. You can then use what you learn to hone how you tackle future exams so you give yourself the best chance of success! Some people wish to discuss and analyse their performance straight after an exam. 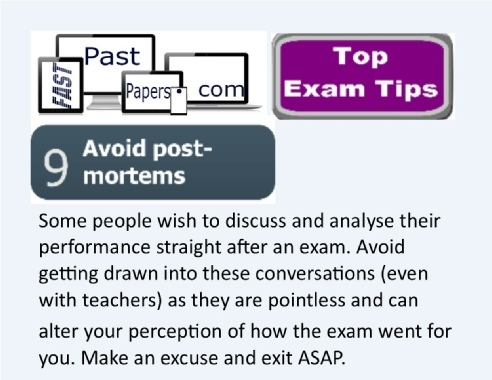 Avoid getting drawn into these conversations (even with teachers) as they are pointless and can alter your perception of how the exam went for you. Make an excuse and exit ASAP. When you get to sit down, stay confident and even a bit excited- because now you get the chance to put into effect what you have practiced. 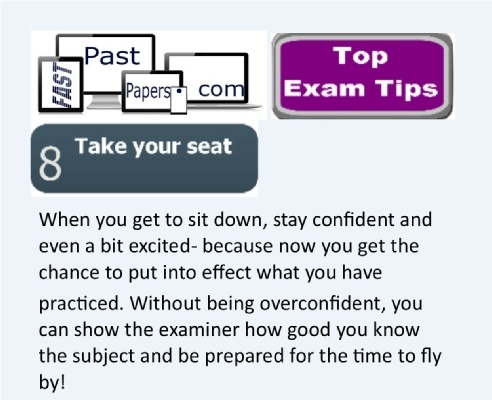 Without being overconfident, you can show the examiner how good you know the subject and be prepared for the time to fly by! You may wish to arrive 10 minutes before the start of the exam (or whatever your centre advises) and to avoid lengthy conversations with others. If you can walk to exam centre on your own, then do so, as you will have time to prepare yourself nicely (“in your own space”). Smile and be positive! 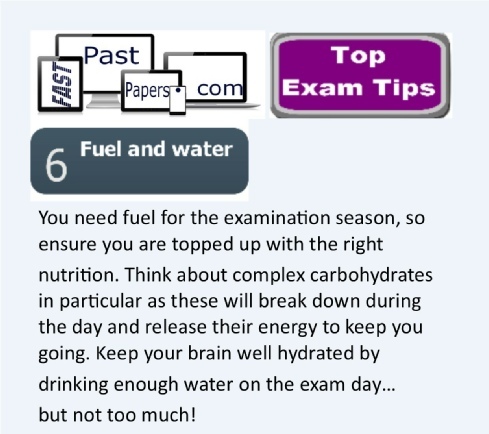 You need fuel for the examination season, so ensure you are topped up with the right nutrition. Think about complex carbohydrates in particular as these will break down during the day and release their energy to keep you going. Keep your brain well hydrated by drinking enough water on the exam day… but not too much! 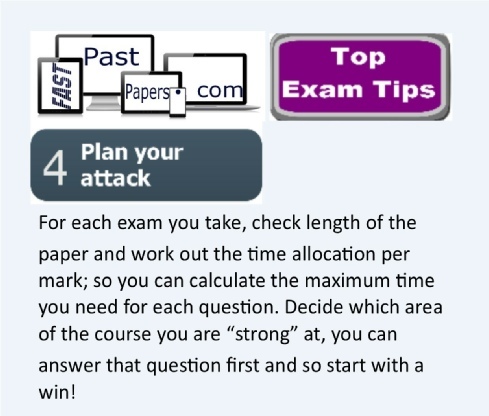 For each exam you take, check length of the paper and work out the time allocation per mark; so you can calculate the maximum time you need for each question. Decide which area of the course you are “strong” at, you can answer that question first and so start with a win! 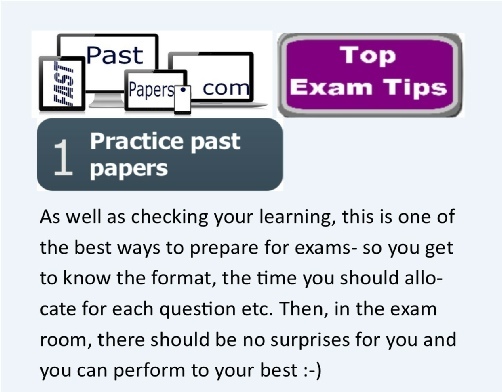 From early evening the day before your exam, put away any studies and exam preparation and relax. Let your brain and nerves have a rest, so read a novel, watch a film (comedy if possible), socialise, etc. Do whatever you want that is enjoyable and not exam orientated- you deserve it! Deal with any of you concerns about the exams you are to sit by seeing teachers, if necessary. Please be realistic, so you don’t need to get overstressed about them. Ignore comments from people about how stressful you must feel! 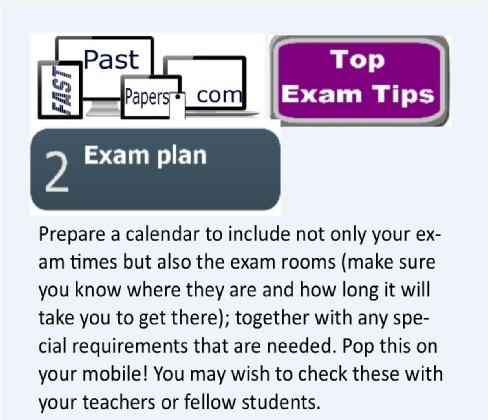 Prepare a calendar to include not only your exam times but also the exam rooms (make sure you know where they are and how long it will take you to get there); together with any special requirements that are needed. Pop this on your mobile! You may wish to check these with your teachers or fellow students.